The Moonga Stakes is a Group 3 race contested in October on Caulfield Cup Day over the Melbourne Spring Racing Carnival. The Group 3 Ladbrokes Moonga Stakes is a 1400m sprint held at Caulfield Racecourse during the Melbourne Spring Racing Carnival. Held under set weights plus penalties conditions, the Moonga Stakes is a race for horses aged four years and older. The Moonga Stakes is held on one of the biggest race days of the year, Caulfield Cup Day. This is the third day of the three day Caulfield Cup Carnival, which begins a week before with Ladbrokes Caulfield Guineas Day, continues on Wednesday with Blue Sapphire Stakes Day and ends on Caulfield Cup Day. Sharing the race schedule with the Moonga Stakes are a host of other Black-Type features. These include the Group 1 Caulfield Cup (2400m), Group 2 Caulfield Sprint (1000m), Group 2 Tristarc Stakes (1400m), Group 3 Coongy Cup (2000m) and the Group 3 Ladbrokes Caulfield Classic. 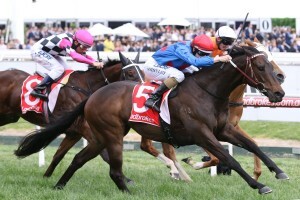 Horses contesting the Ladbrokes Moonga Stakes field may come off a lead-up run in a race like the Group 2 Blazer Stakes (1400m) for mares at Flemington a fortnight earlier or the Group 1 Sir Rupert Clarke Stakes (1400m) run three weeks prior. In 2016 Voodoo Lad improved on a lead-up second in the Sir Rupert Clarke Stakes before winning the Moonga Stakes. The Ladbrokes Moonga Stakes 2017 ran on Saturday October 21, 2017 . Check out the full Ladbrokes Moonga Stakes 2017 Results & Finishing Order below, following the link to read more on the late win by the Darren Weir-trained Ulmann who presented at the right time to defeat his better-fancied stablemate Burning Front, while the midrace leader Echo Effect tired but held for third. OBSERVATIONAL (2) is the only scratched horse from the Ladbrokes Moonga Stakes 2017 field, but it remains a very open betting race. Hard to go past GRANDE ROSSO ($4.80) who is challenging for favouritism from a favourable barrier two draw with Craig Williams riding the Lindsay Park-trained six-year-old who is down in grade after the Group 1 Sir Rupert Clarke Stakes (1400m) run here on October 1. Saluted at the track / distance before that carting 59kg and overall is two-from-three at the 1400m at Caulfield. Outclassed in the Group 1 – chance to atone here. DANISH TWIST ($4.60) is narrow favourite on 54kg with the ‘Magic Man’ Joao Moreira riding the Kris Lees-trained mare who was only 1.4 lengths off Daysee Doom in Sydney’s Group 2 Golden Pendant (1400m) last time out, the form of which has been franked. Needs to handle the Melbourne way, but if she does that she’s got the class to win. BURNING FRONT ($6.50) is the genuine market mover smashed in from $13 with the rails run. Was held up in a crucial stage in the last start seventh at Flemington, but will relish returning to The Heath where the veteran is undefeated (4-4-0-0). The latest Moonga Stakes betting markets provided by Ladbrokes.com.au will be listed below complete with links for you to back your Moonga Stakes Tips in at the right price as soon as released the week of the race. The 2017 Moonga Stakes field and barriers are released by Racing Victoria (RV) on the Wednesday leading-up to Caulfield Cup Day and will be provided in full below once announced. The Ladbrokes Moonga Stakes 2017 Final Field drew 11 middle-distance hopefuls including the Chris Waller-trained All Our Roads with the outside alley to overcome second-up off a Randwick third last start. Burning Front is out to atone for a lead-up seventh at Flemington carrying 60kg and drops back to 57.5kg with the rails run in the Moonga Stakes Field, which also features the fellow Darren Weir-trained Ulmann in gate four up to a more suitable distance after finishing under three lengths back sixth in the Group 2 Gilgai Stakes (1200m) on October 7. The Moonga Stakes nominations close on the Monday of race week and will be published right here as soon as released. In 2017 the Moonga Stakes Nominations attracted a bumper 20 early entries including the in-form veteran Rhythm To Spare coming off a third to Bonneval in the Group 2 Dato’ Tan Chin Nam Stakes (1600m), and four for Sydney’s top trainer Chris Waller led by Epsom Handicap fourth placed mare Foxplay who is also nominated for the Group 2 Tristarc Stakes (1400m) against her own kind on Caulfield Cup Day 2017. The Moonga Stakes was inaugurated in 1982 and has since undergone a huge amount of name changes. Initially a Principal race, the Moonga Stakes was granted Group 3 status in 1994. The Moonga Stakes is one of those races that receives sponsorship for its name in most years. During its short history, the Moonga Stakes has been named in honour of two different race horses, Vo Rogue and Northerly. Listed below are the various name changes the Moonga Stakes has undergone over the years. Notable Moonga Stakes winners include Vo Rogue (1988), Rough Habit (1992), Assertive Lad (2002) and Boban (2013). Moonga Stakes results since 2000 are listed below.